Classic linear style suitable for casual and formal outfit, is lightweight and comfortable. 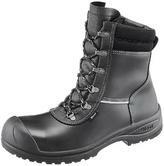 The upper is made with premium water resistant leather, the outsole is flexible and offers excellent slip resistance. 3D mesh lining transfers moisture from the feet and promotes breathability. Single density microporous structured polyurethane sole offers very high slip-resistance and flexibility providing excellent shock absorption. Sievi 12661 Cable ESD protection Shoes conforms to: EN ISO 20347: O2 SRC FO standards. An ankle boot with metal-free toecap and penetration-resistant midsole. SIEVI ELIXIR safety boot extra protection provided by PU cap. SieviBalance improves the rotation torque of the shoe and ensures a better grip and less pressure on the ankles. Durable upper materials keep their shape. Dual insoles provide added comfort, Breathable 3D-dry lining keeps the feet dry. With a shock absorbing heel and a PU Slip-resistant extremely flexible FlexStep sole. Sievi Elixir High XL+ 49-52774-153 Wide Fit Safety Boot conforms to: EN ISO 20345: S3 SRC safety footwear standards. Sievi Jalkine Oy is a long-established, family shoe company based in Lapland. Sievi safety boots is the leading manufacturer of safety and occupational footwear in Northern Europe. This is mainly due to their impressive level of robotics and automation. Created in Finland, Sievi safety boots offer great strength, fit and comfort. This is especially true in colder temperatures, as Sievi has fur lined safety boots. Sievi boots innovates with the latest technology, materials and features. All this, just to develop the best safety boots on the market, fully compliant with EN ISO 20345 standards. Not what your looking for? Then why not check out the full range of products we have to offer in our Catalogue!